13th Bn Officers service dress collar in bronze on the left. 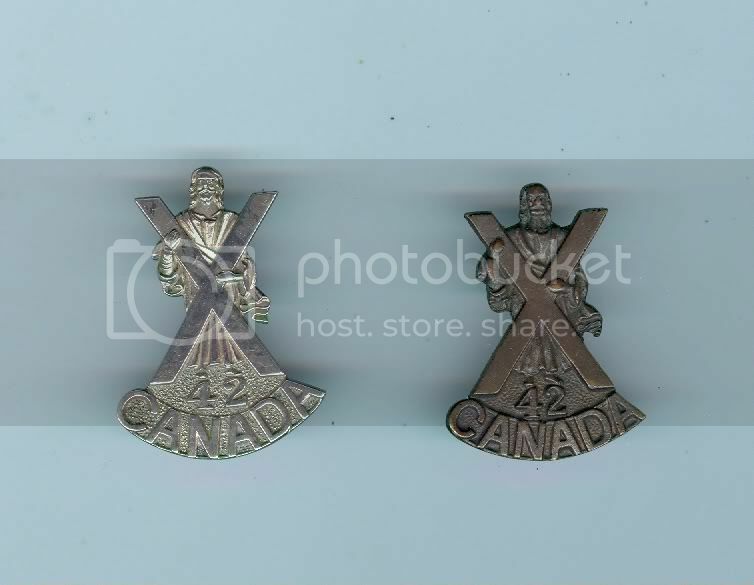 On the right Royal Highlanders of Canada Depot Company no numerals. Last edited by ronmarsden; 20th March 2013 at 21:20. 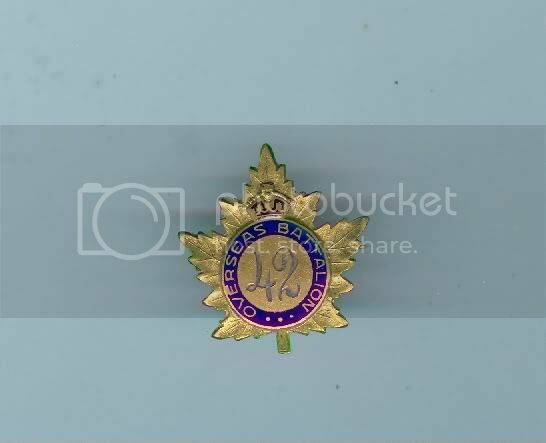 42nd Btn C.E.F. Royal Highlanders of Canada February 1915. 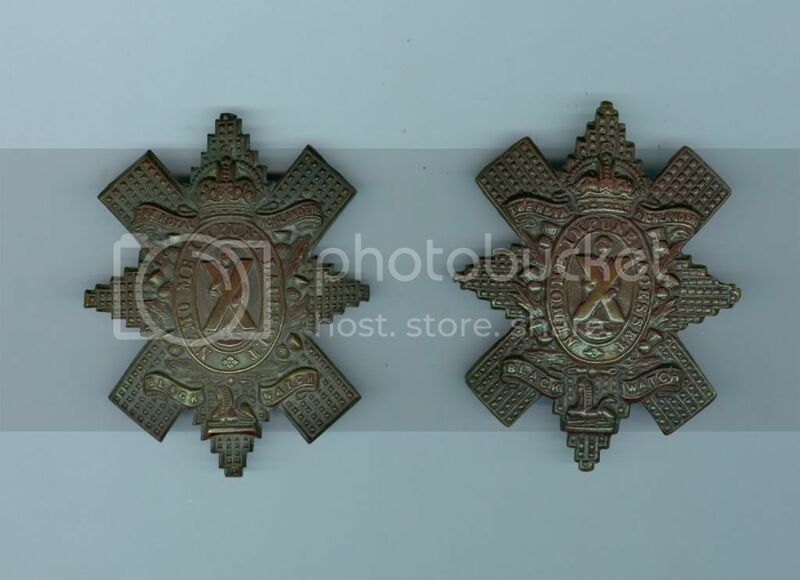 Pair of officers service dress collars. Last edited by ronmarsden; 20th March 2013 at 21:22. Officers 42nd Btn C.E.F. glengarry badge. 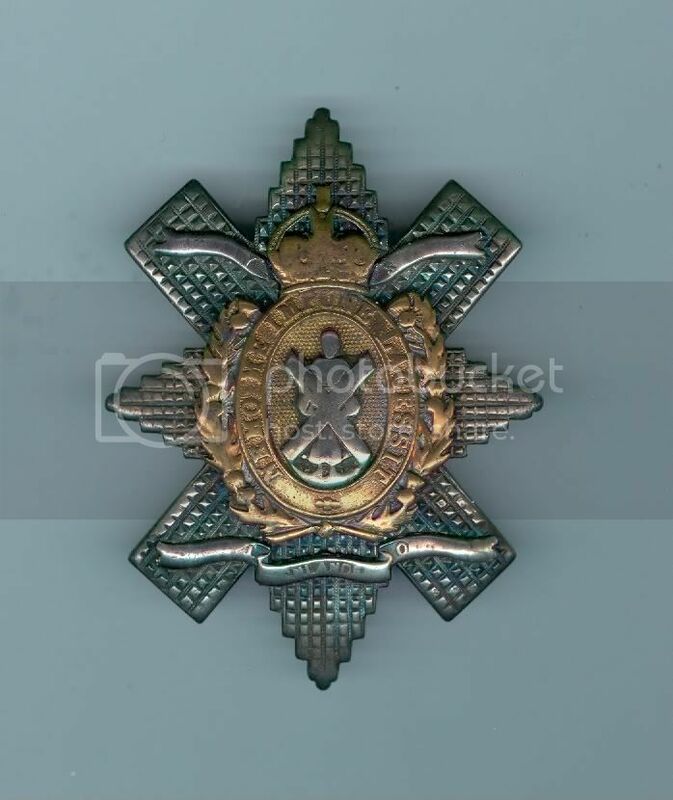 Solid silver badge maker marked Mc Dougalls London. Scrolls should read Forty Second Royal Highlanders of Canada. has four silver loops to the reverse. Last edited by ronmarsden; 20th March 2013 at 21:24. 42nd C.E.F. 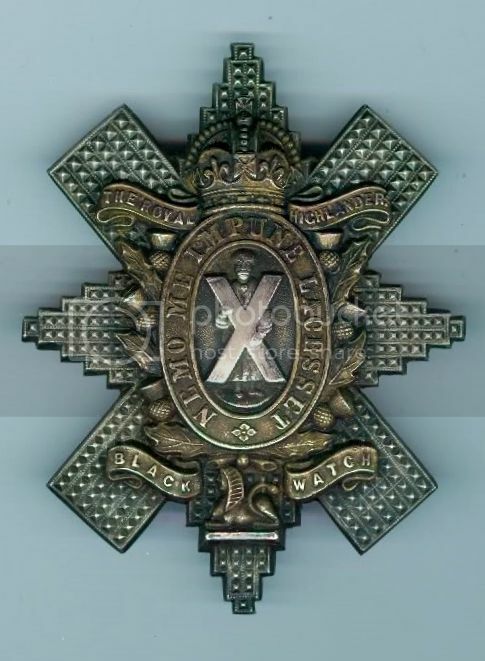 Btn SNCOs glengarry badge. Die-struck in one piece silver, with a gilt wash over the wreath and scrolls. Last edited by ronmarsden; 20th March 2013 at 21:25. 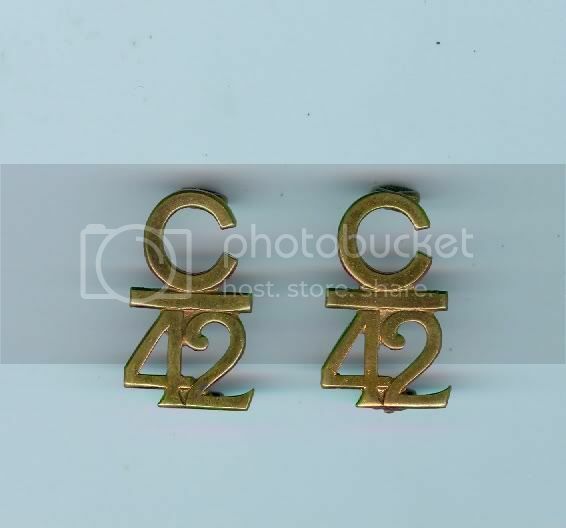 42nd C.E.F.Btn ORs brass collars. Last edited by ronmarsden; 20th March 2013 at 21:27. 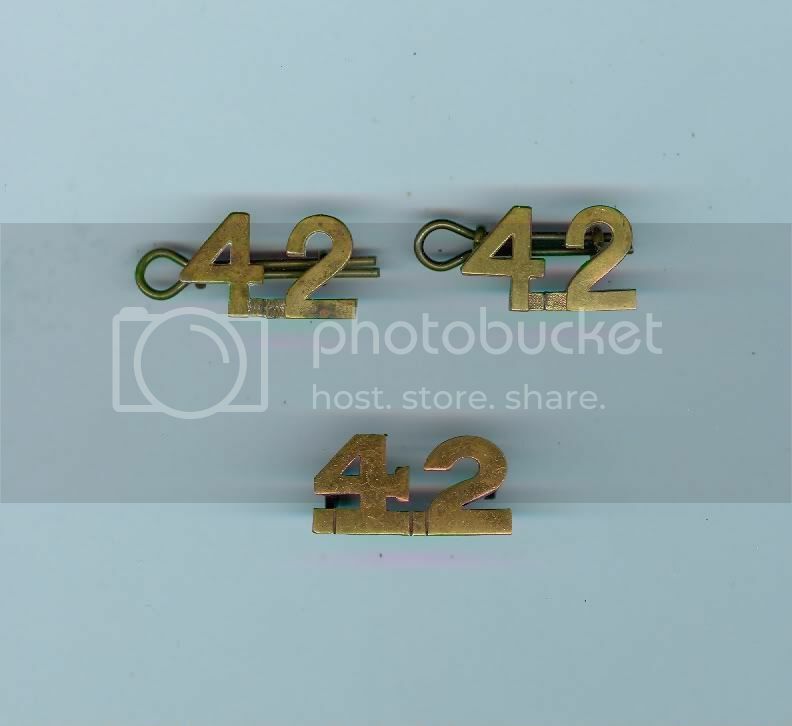 42nd C.E.F.Btn ORs shoulder numerals. Two patterns the single on marked P.W.Ellis Co Ltd 1915. Last edited by ronmarsden; 20th March 2013 at 21:28. 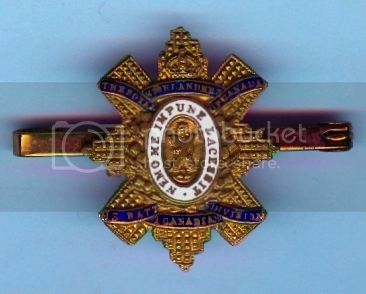 42nd sweetheart brooch in gilt and enamels. Last edited by ronmarsden; 20th March 2013 at 21:29. A new aquisition 13th C.E.F. bar brooch. Last edited by ronmarsden; 30th March 2013 at 20:58. 42nd C.E.F. 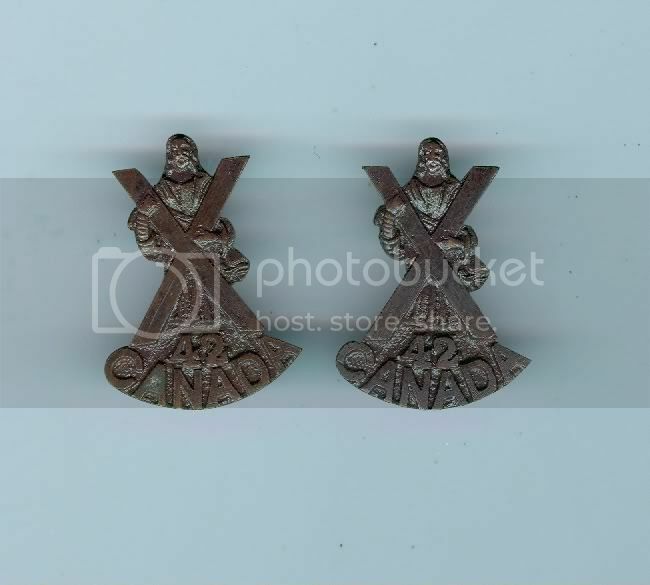 ORs glengarry badges two different patterns with chocolate brown finish. The first struck from the same die as post no 24. Last edited by ronmarsden; 20th March 2013 at 21:32. 42nd C.E.F. 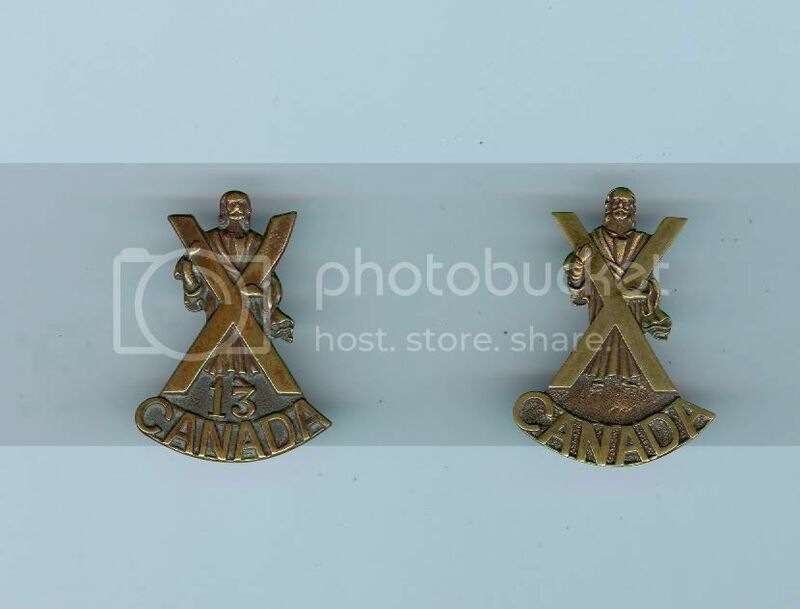 collar badges. Solid silver hallmarked B&P (Bent & Parker) Birm 1918. Officers servce dress pattern superior quality than those in post no 22. Last edited by ronmarsden; 20th March 2013 at 21:33.